Every town has a Crazy Cat Lady, but it's the rare desk that boasts an articulated Crazy Cat Lady Version 2 Action Figure! This 5 1/4-inch tall Crazy Cat Lady has a wild look in her eyes and, appropriately enough, comes with 6 cats, all of whom sport a unique look. Some even share the Crazy Cat Lady's insane eyes! Articulation at the knees, waist, shoulders, and more. 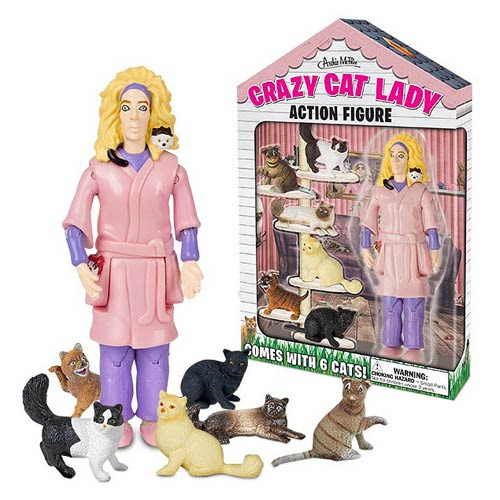 This figure is a variant of the Crazy Cat Lady with the pea green outfit.